Aim : This study investigated the immunomodulatory and anti-tumor effects of Nigella glandulifera Freyn and Sint seeds (NGS) on Ehrlich ascites carcinoma in a mouse model. Materials and Methods : Kunming mice with transplanted Ehrlich ascites tumor cells (EAC) were treated with NGS by oral administration. On the 11 th day after the EAC implant, mouse thymus, liver, spleen and kidney tumors were removed for histopathological analysis. Blood samples were taken for hematological and biochemical analyses. Results : The results indicate that NGS treatment leads to an increase in TNF-α, IL-1β, and IL-2 blood serum levels. Absence of viable EAC and presence of necrotic cells were observed in the tumor tissue of the NGS-treated animals. Conclusions : The study results indicated that a water extract of NGS had the highest anti-tumor effect. Moreover, NGS treatment also showed an increase in the immune system activity. Background: Inula helenium, which belongs to thecomposite family, is an important crude drug in traditional Chinese medicine. Materials and Methods: The effects of ethanol concentration, liquid to solid ratio, extraction temperature, and duration of microwave irradiation on the flavonoid extraction yield were studied through a single-factor experiment. An orthogonal array (L 9 (3 4 )) was then constructed to achieve the best extraction conditions. 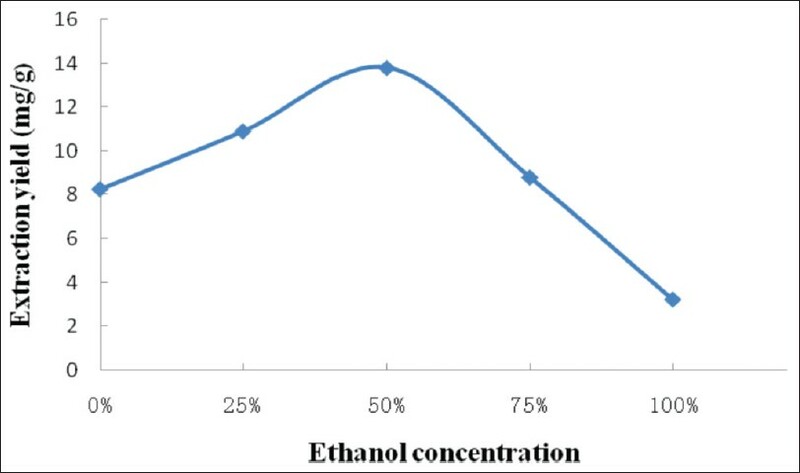 Results: Variance analysis revealed that ethanol concentration significantly affected the extraction yield. The optimal conditions were as follows: ethanol concentration, 50% (v/v); liquid to solid ratio, 15:1; duration of microwave irradiation, 240 s; and extraction temperature, 60°C. Conclusion: Under these optimal conditions, the total flavonoid yield was 18.34 ± 0.64 mg/g. The use of a microwave-assisted process dramatically reduced the time needed for extraction of flavonoids from I. helenium. Background: Lobed kudzuvine root and rhizoma chuanxiong are effective drugs in traditional Chinese medicine. Objective: Extracts of the two medicines were investigated for their in vitro of beta-amyloid (Aβ1-42)-aggregation-and acetylcholinesterase (AChE)-inhibitory activities. Materials and Methods: The interaction of lobed kudzuvine root, rhizoma chuanxiong with both acetylcholinesterase and beta-amyloid (Aβ1-42) were studied by Michaelis-Menten equations, Thioflavin T (ThT) fluorescence analysis and transmission electron microscope (TEM). Results: Inhibition of acetylcholinesterase showed that 1-butanol fraction of the two medicines were noncompetitive inhibition, apparent inhibition constants were 9.947 and 7.1523. ThT fluorescence analysis and TEM results indicated that inhibition of the water fraction and 1-butanol fraction (both lobed kudzuvine root and rhizoma chuanxiong) was better. Conclusion: The result supported further research on chemical constituents and pharmacological mechanisms. Backgroud: To simulate the ischemia-reperfusion injury in vivo, hypoxia/reoxygenation injury model was established in vitro and primary cultured neonatal rat cardiomyocytes were underwent hypoxia with hydrosulfite (Na 2 S 2 O 4 ) for 1 h followed by 1 h reoxygenation. Materials and Methods: Determination the cell viability by MTT colorimetric assay. We use kit to detect the activity of lactate dehydrogenase (LDH), Na + -K + -ATPase and Ca 2+ -ATPase. Do research on the effect which ferulic acid and its drug-containing plasma have to self-discipline, conductivity, action potential duration and other electrophysiological phenomena of myocardial cells by direct observation using a microscope and recording method of intracellular action potential. Results: The experimental datum showed that both can reduce the damage hydrosulfite to myocardial cell damage and improve myocardial viability, reduce the amount of LDH leak, increase activity of Na + -K + -ATPase, Ca 2+ -ATPase, and increase APA (Action potential amplitude), Vmax (Maximum rate of depolarization) and MPD (Maximum potential diastolic). Conclusion: Taken together, therefore, we can get the conclusion that ferulic acid drug-containing plasma has better protective effect injured myocardial cell than ferulic acid. Background: Buckwheat (Fagopyrum spp., Polygonaceae) is a widely planted food crop. Flavonoids, including quercetin, rutin, and kaempferol, are the main bioactive components in tartary buckwheat (Fagopyrum tataricum (L.) Gaertn). From the nutriological and pharmacological perspectives, flavonoids have great value in controlling blood glucose and blood pressure levels, and they also have antioxidant properties. Objective: To optimize the conditions for extraction of quercetin, rutin, and kaempferol from F. tataricum. Materials and Methods: A combination of ultrasound-assisted extraction (UAE) and response surface methodology (RSM) was used for flavonoid extraction and yield assessment. The RSM was based on a three-level, three-variable Box-Behnken design. Results: Flavonoids were optimally extracted from F. tataricum by using 72% methanol, at 60°C, for 21 minutes. Under these conditions, the obtained extraction yield of the total flavonoids was 3.94%. Conclusion : The results indicated that the UAE method was effective for extraction of flavonoids from tartary buckwheat. Background: Glechoma longituba, one of the long-practiced traditional Chinese medicines in history, is still commonly used nowadays in oriental countries. 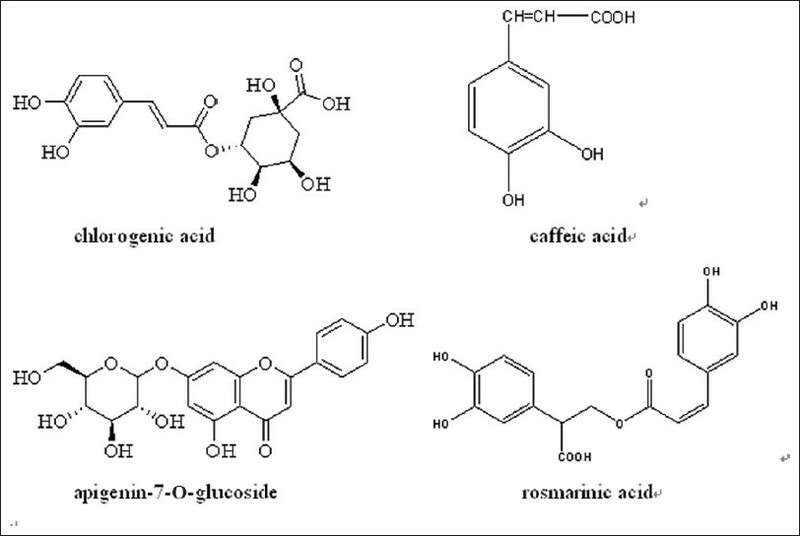 Previous study indicates that phenolic acid and flavonoids have considerable bioactivities, thus, chlorogenic acid, caffeic acid, apigenin-7-O-glucoside and rosmarinic acid were chosen as the marker components for the simultaneous determination to evaluate the intrinsic quality of G. longituba, and related high performance liquid chromatographic method was urgent to established. Materials and Methods: A HPLC method was established for simultaneous determination of four major active components in G. longituba, three batches which collected from different suppliers in Zhejiang, Anhui and Jiangsu Provinces were determined. Results: The contents of chlorogenic acid, caffeic acid, apigenin-7-O-glucoside and rosmarinic acid in G. longituba samples analyzed were 0.00225-0.00234%, 0.0238-0.0242%, 0.00271-0.00313%, 0.830-0.896%, respectively. Conclusion : The developed method can be applied to the intrinsic quality control of G. longituba. Background: Since the ancient times the skin aging application of honeybee venom (BV) is practiced and persisted until nowadays. The present study evaluated the effect of the honeybee venom (BV) on keratinocyte migration in wound healing model in vitro. Objective: To access BV further as a cosmetic ingredient and a potential external application for topical uses, we performed studies to investigate the biologic effect of BV treatment on keratinocyte proliferation and migration in vitro. Material and Methods: BV cytotoxicity was assessed by using a 3-[4,5-dimethyl-2-thiazolyl]-2,5-diphenyl tetrazolium bromide (MTT) assay over 24 h. To assess BV genotoxicity, damage to human epidermal keratinocyte (HEK) was evaluated using the Comet assay. HEK migration was evaluated using a commercial wound healing kit. The skin pro-inflammatory cytokines interleukin (IL)-8 and tumor necrosis factor (TNF)-α were examined to evaluate the pro-inflammatory response to BV. Results: It was found that BV (<100 μg/ml) was not cytotoxic and stimulated more HEK proliferation and migration compared to negative control, and did not induce DNA damage. There were also decreases in IL-8 and TNF-α expression levels in HEK at all time points. Conclusion: These findings highlight the potential of topical application of BV for promoting cell regeneration and wound treatment. Background: Recently, a great deal of attention has been directed toward the use of crude extracts from natural products for cosmetic applications. Thus, we performed a series of experiments to investigate skin depigmenting properties of a crude extract that was derived from a traditional Korean medicinal plant. Materials and Methods: In this study, the depigmentational potency of Cyrtomium fortunei J. Smith was investigated. The inhibitory effects of the root of Cyrtomium fortunei J. Smith extract on melanin production were evaluated by assessing its tyrosinase inhibitory effects, melanin production-inhibitory properties in melan-a cells and depigmenting ability in brown guinea pig skin. Results: The methanolic extract of the root of Cyrtomium fortunei J. Smith appeared to inhibit tyrosinase activity and melanin production in melan-a cells. In addition, this extract exhibited depigmenting ability on Ultra violet-induced hyper pigmentation in brown guinea pig skin. Conclusion: These results suggested that root of Cyrtomium fortunei J. Smith might prove useful in treating skin hyperpigmentation associated with excess sun-exposure. Background: Current evidence supports that consumption of polyphenols has beneficial effects against numerous diseases mostly associated with their antioxidant activity. Honey is a good source of antioxidants since it contains a great variety of phenolic compounds. Objective: The main objective of this work was to investigate the antiproliferative and apoptotic effects of three crude commercial honeys of different floral origin (heather, rosemary and polyfloral honey) from Madrid Autonomic Community (Spain) as well as of an artificial honey in human peripheral blood promyelocytic leukemia cells (HL-60). Material and Methods: HL-60 cells were cultured in the presence of honeys at various concentrations for up to 72 hours and the percentage of cell viability was evaluated by MTT assay. Apoptotic cells were identified by chromatin condensation and flow cytometry analysis. ROS production was determined using 2΄,7΄-dichlorodihydrofluorescein diacetate (H 2 DCFDA). Results: The three types of crude commercial honey induced apoptosis in a concentration and time dependent-manner. In addition, honeys with the higher phenolic content, heather and polyfloral, were the most effective to induce apoptosis in HL-60 cells. However, honeys did not generate reactive oxygen species (ROS) and N-acetyl-L-cysteine (NAC) could not block honeys-induced apoptosis in HL-60 cells. 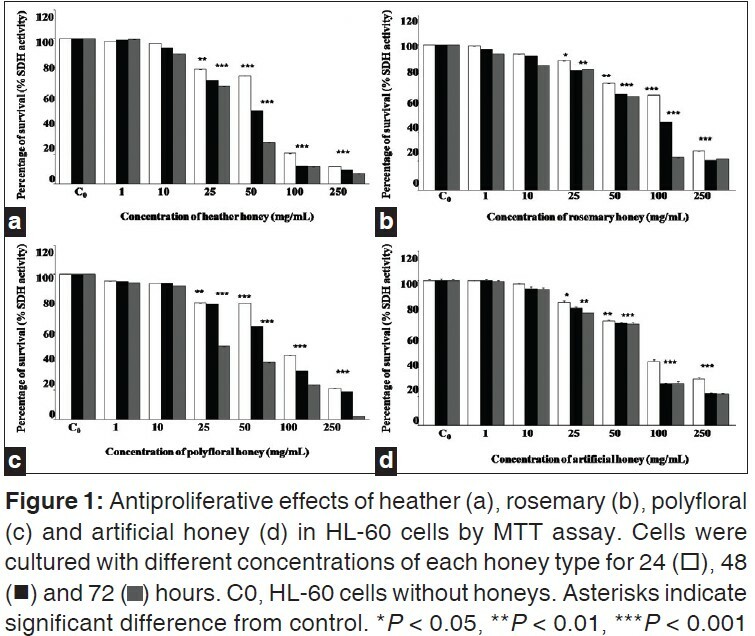 Conclusion: These data support that honeys induced apoptosis in HL-60 cells through a ROS-independent cell death pathway.Moreover, our findings indicate that the antiproliferative and apoptotic effects of honey varied according to the floral origin and the phenolic content. Background: A method for chemical fingerprint analysis of Hibiscus mutabilis L. leaves was developed based on ultra performance liquid chromatography with photodiode array detector (UPLC-PAD) combined with similarity analysis (SA) and hierarchical clustering analysis (HCA). Materials and Methods: 10 batches of Hibiscus mutabilis L. leaves samples were collected from different regions of China. UPLC-PAD was employed to collect chemical fingerprints of Hibiscus mutabilis L. leaves. Results: The relative standard deviations (RSDs) of the relative retention times (RRT) and relative peak areas (RPA) of 10 characteristic peaks (one of them was identified as rutin) in precision, repeatability and stability test were less than 3%, and the method of fingerprint analysis was validated to be suitable for the Hibiscus mutabilis L. leaves. Conclusions: The chromatographic fingerprints showed abundant diversity of chemical constituents qualitatively in the 10 batches of Hibiscus mutabilis L. leaves samples from different locations by similarity analysis on basis of calculating the correlation coefficients between each two fingerprints. Moreover, the HCA method clustered the samples into four classes, and the HCA dendrogram showed the close or distant relations among the 10 samples, which was consistent to the SA result to some extent. 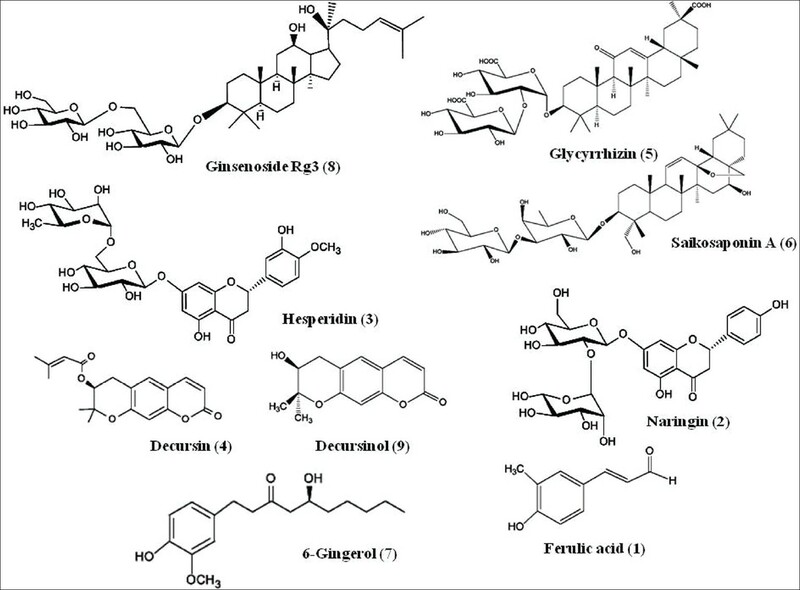 Background: Many more fungal polysaccharides have been reported to exhibit a variety of biological activities, including anti-tumor, immunostimulation, anti-oxidation, and so on. The non-starch polysaccharides have emerged as an important class of bioactive natural products. Objective: To investigate the anti-microorganism, anti-tumor, and immune activities of a novel polysaccharide (TMP-A) isolated from Tricholoma matsutake. Materials and Methods: The anti-microorganism activity of purified polysaccharides (TMP-A) was evaluated by the inhibition zone diameter, the anti-tumor activity was evaluated by the S180 tumor cells that were implanted subcutaneously into the Kunming strain male mice in vivo, and the immune activity was evaluated by lymphocyte proliferation and macrophage stimulation, respectively. Results: In this study, the most susceptible bacteria of TMP-A at a concentration of 20 mg/ml was Micrococcus lysodeikticus (inhibition zone diameter 24.38 ΁ 1.19 mm) and the TMP-A did not show any antifungal activity for the tested stains of the fungi. In addition, the inhibitory rate in mice treated with 80 mg/kg TMP-A could reach 68.422%, being the highest in the three doses, which might be comparable to mannatide. The anti-tumor activity of the TMP-A was usually believed to be a consequence of the stimulation of the cell-mediated immune response, because it could significantly promote the lymphocyte and macrophage cells in the dose range of 50-200 μg/mL and in the dose range of 100 - 400 μg/mL in vitro, respectively. Discussion and Conclusion: The results obtained in the present study indicate that the purification polysaccharide of Tricholoma matsutake is a potential source of natural broad-spectrum, anti-microorganism, anti-tumor, and immunomodulation. Background: Rhizoma dioscoreae nipponicae is a perennial herb and its roots have been widely used in Traditional Chinese Medicine (TCM). Objective: To develop and optimize the extraction and hydrolysis technology of diosgenin from Rhizoma dioscoreae nipponicae. Materials and Methods: 1-methyl-3-(3-sulfopropyl)-imidazolium hydrogen sulfate ([PSMIM]HSO 4 ), as a kind of functional ionic liquid, replaced inorganic acid, and was used in a one-step ultrasonic extraction and hydrolysis for the preparation of diosgenin (the aglycone of dioscin and an important precursor chemical in the pharmaceutical industry) from Rhizoma dioscoreae nipponicae , for the first time. The effects of various factors were evaluated. The obtained product was studied using high performance liquid chromatography (HPLC). Results: About 6.35 mg of diosgenin could be obtained from 2.0 g of raw material. 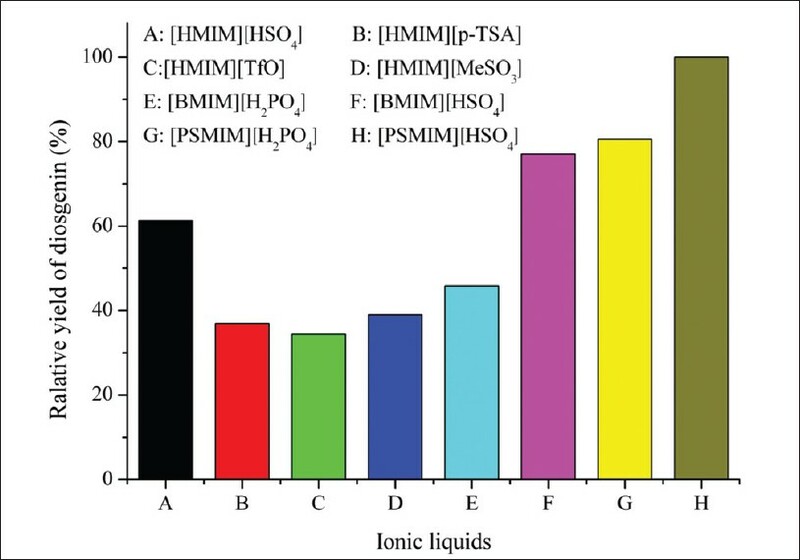 Reusability and recycling of the ionic liquid were validated with fairly good results. The ionic liquid solution was reused four times, and the final extraction efficiency only decreased by 5%. Conclusion: In virtue of the obvious advantages of the green extraction and catalytic solvent, with further study, it is believed that this new one-step preparative method promises to replace the traditional methods. Background: DNA barcode-based molecular characterization is in practice for plants, but yet lacks total agreement considering the selection of marker. Plant species of subfamily Rauvolfioideae have long been used as herbal medicine by the majority of tribal people in Northeast (NE) India and at present holds mass effect on the society. Hence, there is an urgent need of correct taxonomic inventorization vis-à-vis species level molecular characterization of important medicinal plants. Objective: To test the efficiency of matK in species delineation like DNA barcoding in Rauvolfiadae (Apocynaceae). Materials and Methods: In this study, the core DNA barcode matK and trnH-psbA sequences are examined for differentiation of selected ethnomedicinal plants of Apocynaceae. DNA from young leaves of selected species was isolated, and matK gene (~800 bp) and trnH-psbA spacer (~450 bp) of Chloroplast DNA was amplified for species level identification. Results: The ~758 bp matK sequence in comparison to the trnH-psbA showed easy amplification, alignment, and high level of discrimination value among the medicinal Rauvolfioidae species. Intergenic spacer trnH-psbA is also exhibited persistent problem in obtaining constant bidirectional sequences. 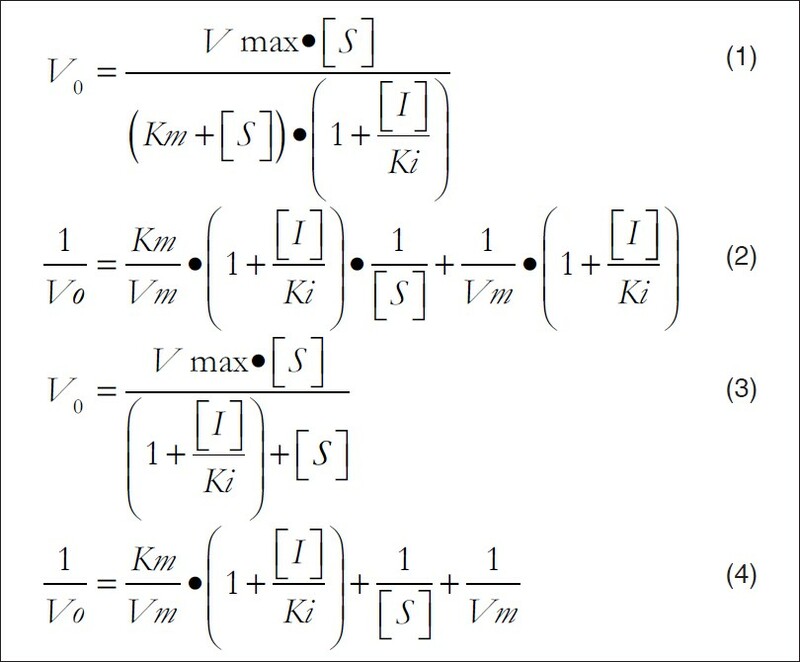 Partial matK sequences exhibited 3 indels in multiple of 3 at 5 end. Evidently, generated matK sequences are clustered cohesively, with their conspecific Genbank sequences. However, repeat structures with AT-rich regions, possessing indels in multiple of 3, could be utilized as qualitative molecular markers in further studies both at the intra-specific and shallow inter-specific levels like the intergenic spacers of CpDNA. Conclusion: matK sequence information could help in correct species identification for medicinal plants of Rauvolfioideae. Background: Anti-phospholipid syndrome is a thrombogenic and systemic autoimmune disorder that influences fetal life throughout gestation period. Over expression of tissue factor on the surface of monocyte(s) is reported to be a major causative agent in inducing anti-phospholipid antibody-mediated placental thrombosis and fetal loss in pregnant women. The over expression of tissue factor is proposed to be due to high levels of blood cholesterol and oxidized lipoproteins. 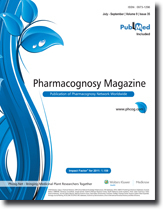 Objective: In this study, we report the lipid-lowering property and anti-tissue factor activity of one of the naturally occurring coumarin derivates 6,7-dimethoxycoumarin, found aplenty in Chinese medicinal plant Artemisia scoparia, and its effect on tissue factor mRNA expression in experimental anti-phospholipid syndrome. Materials and Methods: Adult female mice were immunized with cardiolipin and beta-2-glycoprotein-1 to induce experimental anti-phospholipid syndrome. 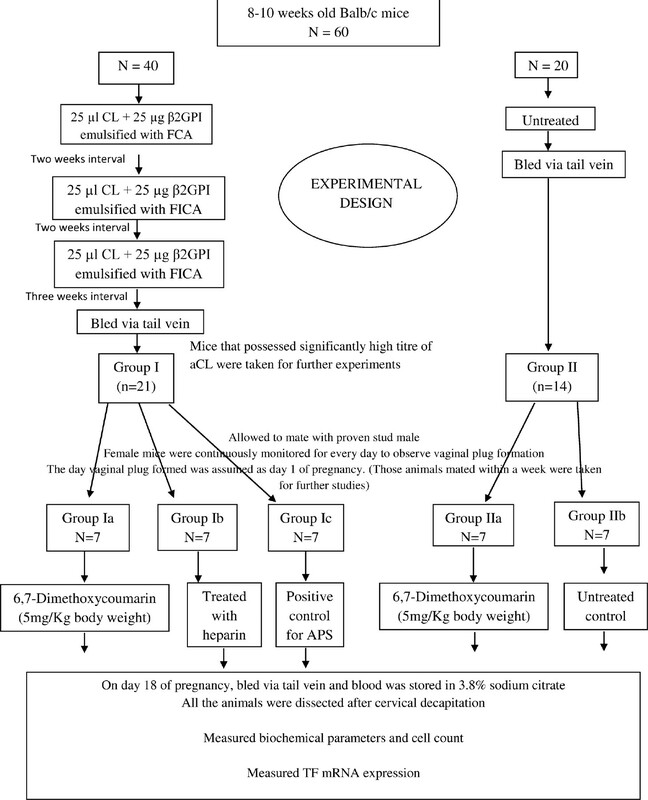 Female mice with high titer of aCL were allowed to mate with male, and the female mice were treated with 6,7-dimethoxycoumarin on a daily dose of 5 mg/kg body weight from day 3 to day 15 of gestation. On day 18 of pregnancy, all the animals were dissected to measure biochemical parameters in blood, and TF mRNA expression levels were measured in placenta. Results: Treatment with 6,7-dimethoxycoumarin significantly reduced the levels of cholesterol and plasma lipids by its potent hypolipidemic property, which eventually reduced the over-expression tissue factor at mRNA levels in placenta. We believe that further studies in animal model would reveal the potential therapeutic properties of 6,7-dimethoxycoumarin against anti-phospholipid syndrome. Conclusion: The 6,7-dimethoxycoumarin is capable to reduce the expression of TF in placenta at the mRNA level and thrombus generation indirectly by its potent anti-TF and anti-oxidant activities. Background: Bozhougyiqi-Tang (BZYQT) is of traditional herbal medicine used for enhancement of digestive capacity. Objective: An accurate and reliable simultaneous determination using a HPLC-DAD and ESI-MS was developed and validated for the qualitative and quantitative analysis of 9 major compounds, ferulic acid (1), naringin (2), hesperidin (3), decursinol (4), glycyrrhizin (5), saikosaponin A (6), 6-gingerol (7), ginsenoside Rg3 (8), decursin (9), in traditional herbal medicine 'Bozhougyiqi-Tang.' 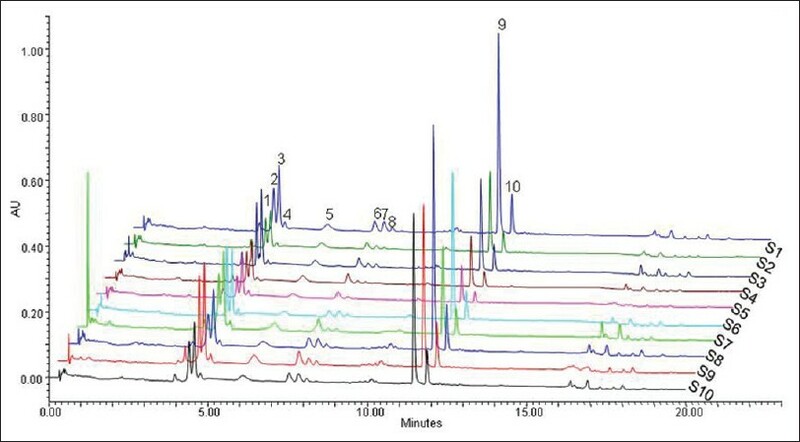 Materials and Methods: The chromatographic separation of 9 compounds was performed on a SHISEIDO C 18 column (250 mm × 4.6 mm i.d., S-5 μm) using gradient elution with 0.1% trifluoroacetic acid and acetonitrile at a flow rate of 1.0 ml/min. The 9 compounds were identified based on peak retention time and UV spectrum and MS data of these compounds. Results: This developed method showed good linearity (R 2 > 0.999). The LOD and LOQ of the major compounds were less than 0.09 and 0.28 μg/ml, respectively. The intra - day and inter - day RSD values were within 2.06% and 1.64%, respectively. The mean recoveries were from 92.10% to 108.56% with less than 1.88%. The results indicated that established method had good precision and accuracy. Conclusion: The new method was successfully applied to the simultaneous analysis of 9 compounds in Bozhougyiqi-Tangs samples.